Generally Monday through Friday, 10-7, with some flexibility. I know first hand what this is like. My back ached from degenerative disc disease, and my life, while not at all “bad,” felt flat and passionless. I wanted more, and after a long search, finally encountered a kind of healing that achieved it, and I found a peace and a clarity I had all but forgotten. As more things cleared up for me and life got better, I wanted to help other people experience the healing and freedom I had found. I combined certification with studying why some people found healing while others did not and what they did differently. I also studied how people were able to heal themselves, as well as delving into Taoist practices used to promote longevity and well-being. 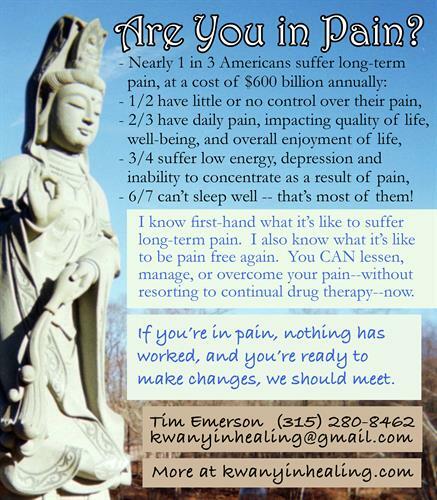 The result was Kwan Yin Healing, offering connective energy healing and programs in self-healing, getting unstuck, meditation and more. 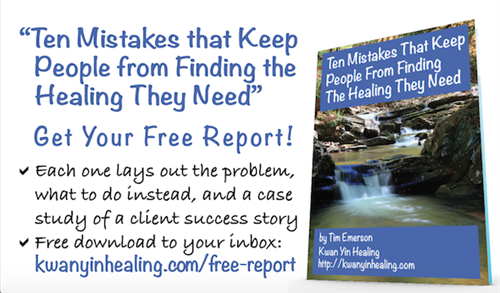 Free booklet: "Ten Mistakes that Keep People from Finding the Healing they Need"